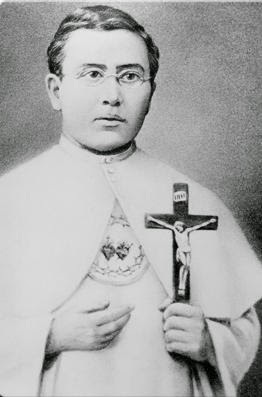 Saint Damien was born in Belgium. He joined the Sacred Hearts Fathers and went to Honolulu, Hawaii, to work in missions. Then when he was 33, he volunteered to work in a leper colony on smaller Hawaiian island called Molokai. Back then, there was no cure for leprosy (or Hansen's Disease) like there is today, so the colony was completely cut off from other people. Damien built hospital facilities and clinics and churches to take care of the patients there. He also built about 600 coffins. Eventually, he caught the disease himself, and he died in 1889. Even though there are medicines that cure Hansen's Disease, there are people around the world who still suffer from the disease. The Damien the Leper Society works to provide medicine and care for lepers who are forced to live in remote jungles of Vietnam and the Philippines. Today, make a donation (any amount) to this society in St. Damien's name.